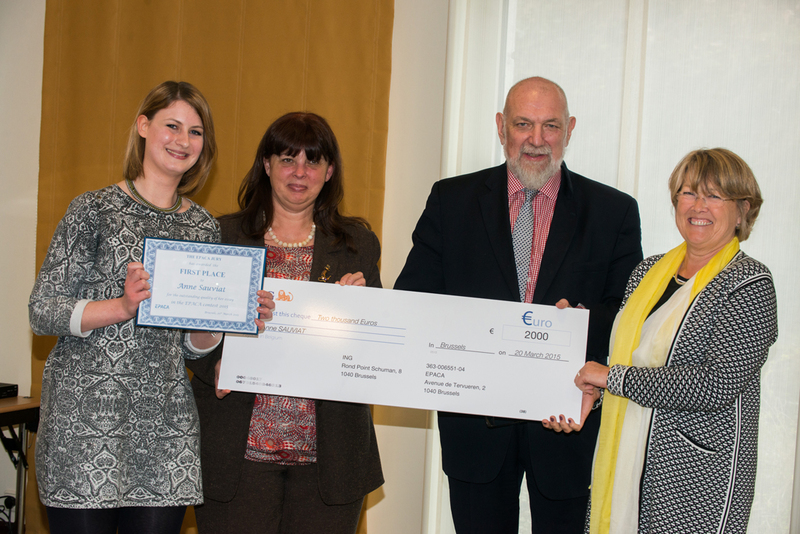 Brussels, 20 March 2015 – The first prize of the fifth EPACA ESSAY CONTEST 2015 was handed over by Lisette Tiddens-Engwirda, members of the EPACA Professional Practices Panel to Anne Sauviat from FleishmanHillard during EPACA’s Annual General Meeting, 20 March 2015. The jury is composed of the members of the EPACA Professional Practice Panel: Lisette Tiddens, Edit Herczog, John Bowis, Tom Spencer and Alain Perroy. The EPACA 2015 Essay Contest, with the topic “How to improve public trust in EU public affairs”, aimed to highlight the Public Affairs profession and bring recognition to young practitioners. Young talents under the age of 30 and working for consultancies member of EPACA were invited to take part in shaping our profession by sharing their views and experiences in an essay competition. The Jury was the members of our Professional Practices Panel. Anne Sauviat was unanimously designated by our Jury as the winner. Her essay showed both talent and originality! Runners up in the contest were Nathalie Rubin-Delanchy, from Cambre Associates ranking second, and Katalin Jakucs from Kreab ranking third. We congratulate them for the excellent quality of their essays. To what extent are EU public affairs public? Which ‘public’ is actually encompassed under such appellation? These are important questions when thinking about the issue of public trust in EU public affairs for a reason: trust comes from a feeling of inclusion, which itself encompasses both a physical and symbolic dimension. Apathy and skepticism have increasingly taken over public opinion on European politics. This mistrust is notably due to Europeans feeling alienated from a political environment and process they expect to be integral to. Yet, many perceive European politics as unreachable and incomprehensible conversations between political, economic and industrial elites. In this context, public affairs consultancies mainly appear as illegitimate intermediaries influencing EU politicians for private stakeholders ‘ interests. Thus, building trust in EU public affairs necessitates overcoming the negative connotation they often assume. The notion and activity of lobbying should be brought back to its original meaning and purpose: providing decision-makers with practical information on topics they are not necessarily fully aware of, and informing them of the demands from the various groups of the civil society they represent. European public affairs would be better acknowledged if they were given a more ‘positive’ definition and if their relevance for both public and private entities were promoted. Public trust also relies on the transparency of the information and services exchanged by the various actors (in)directly involved in the European political process. Giving accessibility to such data helps the public better understand and confide in the reliability of politically-invested individuals and organisations. Finally, beyond the status of witnesses, European citizens should be more extensively and actively included in the public affairs debates. The new methods of communication and wide range of social media can significantly contribute to the ‘re-democratisation’ of European public affairs and their relative re-appropriation by the general public. Trust among all players involved in policy-making is key to ensuring the efficiency of the process. Attempts to improve trust in EU public affairs have so far focused on improving transparency, as the transparency register obviously implies. In the EU bubble, it seems, trust stems from the provision of detailed information – yet persisting mistrust begs a solution to be sought elsewhere. A look at characteristics which make other professions appear trustworthy can inform us on what is missing in EU public affairs and more importantly how to fix it. The most trusted professions in the world, according to rankings, are teachers and firefighters. Two important qualities are perceived to distinguish them from other professions: honesty (openness and lack of any hidden agenda) and familiarity (understanding of their profession and a sense of personal closeness). EU-level initiatives seek to achieve honesty but do little to create familiarity – to many, it is still unclear what lobbies or consultancies actually do. In addition, the websites where the information is published often target a specialized public and are unknown to people outside of Brussels. However, if lobbying actions were more clearly spelled out through channels that citizens actually use – principally social media – this would allow the public to feel part of the process and give individuals a platform to voice their opinions. Social media is accessible to everyone, familiar, and generally perceived as a way of communicating freely. It provides an outlet for EU officials, lobbyists and citizens to exchange views with fewer filters. If public affairs professionals and EU officials used social media to communicate more about who they meet, what they discuss, and allow the public to join in the discussion, it would create a sense of familiarity with the whole process and lay the foundations to a more trusting relationship. Brussels is the second biggest lobbying capital in the world where nearly everyone, from NGOs to Member States, is trying to influence the decision-making process. Still, lobbying is often only associated with big industry and the public affairs firms that represent them. Hence, the key to improving trust in public affairs is in the hands of PA firms. First, instead of waiting for EU institutions to come up with new proposals to improve transparency, PA firms could proactively publish information on their clients, earnings and meetings. Also, they could dedicate some time to receive visitor groups and to feature case studies on their website to give citizens a better understanding of their activities and to illustrate the necessity and added-value of public affairs. Second, PA firms need to do expectation management. Their clients need to have a clear idea of what the firms can and are allowed to do. Respecting and explaining the EPACA code of conduct to clients is essential to ensure they understand how far the agency can go when representing their interests. Third, PA firms should launch a campaign to improve people’s general perception and understanding of the sector. Of the more than 30,000 lobbyists in Brussels, many are recent graduates with a passion for EU affairs. PA firms should show the world that these young professionals do not run around with briefcases full of cash but spend most of their time doing monitoring, following parliamentary debates and reporting on the development of EU policies. The Juncker Commission has already made an effort to boost transparency by publishing information about Commissioners’ meetings with interest groups. Now it is up to the sector to do its part and help ensure that citizens understand that public affairs is a fundamental part of democracy.